Waikiki Swim Club® is primarily focused on ocean swimming, and meet on weekends for long distance open ocean swims. Many, but not all, of our members were competitive swimmers and swim in various masters swim programs during the week. Others are strong recreational swimmers that have built their confidence in the ocean over time. In the pool we do "yardage" interval swimming, but in the ocean we do "mileage," as in 2-3 miles on weekend swims. Many members also compete in a variety of ocean races and biathlons throughout the year on Oahu (See Ocean Races page). Video by Rex and posted on Vimeo December 27, 2013. Encountered a big school of Papio who were on the verge of becoming Ulua. This footage was taken off Queen's Surf near the Natatorium on Dec 27 during a 45-minute swim. The water is teeming with fish, better than Hanauma bay. Music is "The Anchor Song" by Bjork. We welcome swimmers from all around the world to enjoy our ocean and our friendship. If you are visiting or living on Oahu and interested in ocean swimming, please answer the questions in the "swimmer ability assessment" and submit the form. This will be automatically delivered to our volunteer staff. Responses to form submissions and emails are typically within three to four days. If you are visiting Oahu, please include the dates of your stay and the area where you are staying, along with your swimming ability information. The contact will advise you of potential swims appropriate for your ability and/or any prevailing conditions that may cancel the weekend swim or change the location. Waikiki Swim Club is staffed by unpaid volunteers, with jobs and family obligations. We will try to respond to your form submission in a timely fashion, but please understand that responses may be delayed and are not guaranteed. Mahalo. Elks Lodge 616, Waikiki "Shaka Cam"
Club members usually swim on Sunday mornings, primarily in Waikiki, meeting at Kaimana Beach at 8am (also known as Sans Souci Beach), conditions permitting. Many head to the North or West Shores during the summer months when the big winter surf is done. 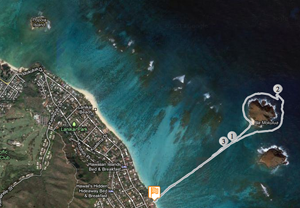 During Kona weather, when Trade Winds are light, we may head to the Windward side of the island to Kailua to swim around Popoi&apos;a or the Mokulua Islands. There are no mass emails to all members about Sunday Open Ocean swims as these are not club-sanctioned events and there are no lifeguards or escorts. Groups develop, by similar speed, through time and knowledge of one another&apos;s swimming levels. WSC has a Facebook Group for members-only, where people may contact each other. We are concerned about safety and not leaving somebody behind. We do have members that never competed, but have technique over a period of time and are very comfortable in the ocean and swimming ocean races. While Waikiki and many other areas of Oahu offer pristine waters to swim in at a comfortable temperature year-round, the open ocean presents a number of hazards. Conditions can change rapidly including strong currents from the tidal changes, shallow reefs with breaking waves, or heavy chop when current meets the wind. Following heavy rains, runoff may cause turbidity and "brown water" warnings. Boats are a special concern, as swimmers may be hard to see in the water, especially if there is a lot of glare on the water. (Brightly colored swim caps are a must in the ocean). Box jellyfish arrive on lunar cycles, which can inflict very painful stings and allergic reactions in those susceptible. Yes, there are sharks in Hawaii. However, we have not had problems with our swimmers. We do often see a white tip sleeping inside a shipwreck. We do see a lot of sea life, which is a big reason we're out there. Fish, turtles, spinner dolphins, eagle rays, a rare manta ray or monk seal and whales breeching is something we never get tired of. Many of our marine animals are protected by law and must not be harassed, or touched. Video by Rex Jakobovits and posted on Vimeo February 26, 2014. So, how do you know who to swim with? If you&apos;re not ready for the open ocean yet, or even if you are, you should consider joining one of the masters swim programs. There are masters groups in Kailua, The University of Hawaii Manoa, Iolani School, Oahu Club in Hawaii Kai, North Shore Masters and some of the military bases, or the Nuuanu YMCA is a good place to start. Check our "Links" tab for more resource information. Additionally, many people swim in the morning or afternoon at Ala Moana Beach Park. The park has a 1,000-meter long course protected from the open ocean by a shallow reef. 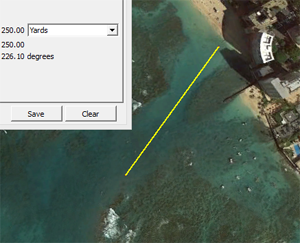 Some people swim the Kaimana Beach Channel to the windsock and back. The distance is approximately 200 meters. Keep in mind that swimming back in against the outgoing water is harder than going out. Participating in organized events will help you set goals and gauge your progress. AND, you will start meeting people that you may want to swim with. Look at our Ocean Races page to spot some events to set as goals. Waikiki Swim Club is planning to hold a couple of swim clinics in October and November at the University of Hawaii, Duke Kahanamoku Swim Complex. Watch the "Announcements" on our site for those dates and details. Also, please note that you swim at your own risk. Do not swim in the ocean if you are of potential hazards, such as surf, reef, currents, and marine life. More information on Ocean Safety can be found at the Oahu Lifeguard's website. Also, check the Oahu Box Jellyfish Calendar, below. These critters show up monthly approximately 8-11 days after the full moon. We advise that you do not swim when Box Jellyfish are present, or expected. They are found primarily on the south facing shores, but have occasionally shown up on the north shore. Always check with lifeguards about hazardous conditions before swimming. Please be sure to communicate clearly with your contacts about where and when to meet and realize that there may be other groups of swimmers of various sorts in the area. Know who you are swimming with and stay with the group even if you are a faster swimmer. Please bring and wear a brightly colored cap to swim in the ocean for visibility. Bright pink, green, orange, red or yellow are the best colors. Black, white and pale colors should be avoided. Wetsuits are not needed, but sun protection is. Apply waterproof sunscreen at least 30 minutes before entering the water, especially on your face so it doesn&apos;t get into your eyes which can cause burning and swelling. Some people need a little Vaseline on the neck or other areas prone to chafe.